Click the image below to navigate through DiscoverSim's virtual menu. If you would like to view our DiscoverSim features page, please CLICK HERE. Easy to use with Six Sigma language - specify Inputs (X's) and Outputs (Y's). Ideal for DFSS, Risk and Project Management. Powerful - 53 continuous and 10 discrete distributions. Distribution Fitting with Automatic Best Fit, specify correlations between inputs. Fast - accelerated calculations with Excel spreadsheet interpreter. Identify important X's with Sensitivity Analysis based on correlation or stepwise regression - includes quadratic terms! Discover solutions to difficult problems with Global Optimization. Optimize statistics such as dpm or Ppk and allow for constraints. 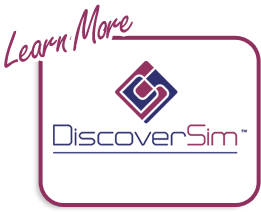 DiscoverSim is also bundled with SigmaXL Version 8 for statistical and graphical analysis.